How can I purchase Pearl Mini? You can order a Pearl Mini from any of our channel partners. Use our handy dealer locator to find a dealer nearest to you. How does Pearl Mini differ from Pearl-2? Pearl Mini is an all-in-one video production system that does video encoding, switching, recording, and streaming – just like Pearl-2! 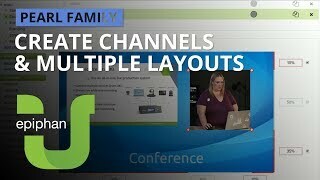 The biggest difference is the number of video ports available, as well as the number of program channels supported. 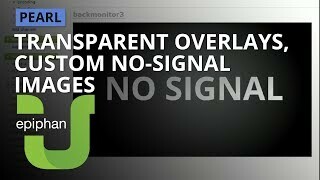 Is Pearl Mini a video encoder? Yes, Pearl Mini is a video encoder, and also so much more than that! Pearl Mini is an all-in-one standalone live video production system. You can simultaneously capture, encode, combine, stream and record multiple inputs in resolutions up to 1080p, and even switch between them in a live broadcast. How do I control Pearl Mini? For confidence monitoring and easy switching, recording, and live streaming control, you can use Pearl Mini’s touch screen or Epiphan LIVE, which is a tablet and mobile friendly web interface designed for easy control of your Pearl Mini. And secure remote login allows you to control your Pearl Mini from just about anywhere there’s access to the Internet. 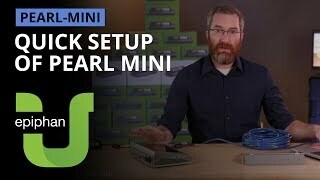 How do I configure Pearl Mini? Pearl Mini is ready to use right out of the box! Plug in a source into the back of Pearl Mini and you can capture, stream and record right away! For additional configuration, use the web-based Admin panel interface on the same local network as your Pearl Mini. With secure remote login, you can access the web-version of the Admin panel from just about anywhere there’s Internet access to do rescue troubleshooting and channel configuration. The touch screen lets you control switching for Pearl Mini’s video mixer, load saved configuration presets and perform recording or streaming control. 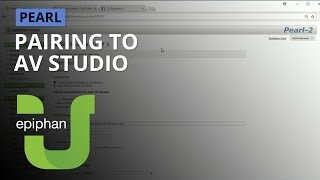 How long does my channel stay paired to my AV Studio account? When you’ve paired a channel with your free AV Studio account to enable secure remote login, your Pearl Mini stays paired until you manually unpair the channel. How many sources can Pearl Mini capture? Pearl Mini can encode multiple Full HD 1080p programs at a time. Within your program(s), you can use multiple cameras and sources connected to Pearl Mini’s two HDMI ports or 3G-SDI port. What codecs does Pearl Mini use? Can I plug my USB web camera in to Pearl Mini? No. The USB ports are only for managing media and downloading recordings. What audio inputs are available? There are two XLR (balanced)/TRS (unbalanced) combo jacks on the rear panel of Pearl Mini that function as a stereo pair (left/right), but you can configure the two combo jacks to work as two separate mono inputs using the Admin Panel. The XLR/TRS audio inputs support pro-level audio devices such as mixers at +4 dBu signal level with lots of headroom and can also accept mic-level signals. Pearl Mini offers gain control so you can boost the input signal if needed. There’s also two RCA jacks on the rear panel of Pearl Mini, which operate as a stereo pair (left/right). They accept -10 dBV consumer line-level audio signals, which is perfect for audio from devices like laptops and iPods. Plus there’s a 35 mm stereo jack on the rear panel, which accepts both -10 dBV consumer line-level audio signals and mic-level signals from dynamic and electret microphones. What is the SD card slot used for? Pearl Mini requires an SD card to store video recordings that you make using Pearl Mini. We recommend that you install an SD card that is at least 64 GB (class 10) up to a maximum 512 GB U3 SD card. The SD card can be removed and you can transfer recorded files from Pearl Mini that way, but the SD card must be installed for Pearl Mini’s record function to work properly. There are easier ways to transfer recordings off of Pearl Mini, like using the USB 3.0 ports or by downloading recordings over the network using Epiphan Live or the Admin Panel. 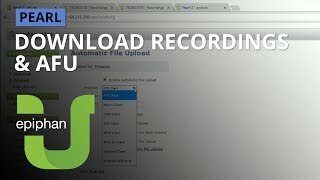 You can even configure recordings to be automatically transferred to a locally connected USB 3.0 drive or network storage device using SCP, FTP, SFTP, RSYNC or CIFS when Automatic File Upload (AFU) is configured. Can I connect an external display for confidence monitoring? Yes. There’s an HDMI output on the rear panel of Pearl Mini that can be used to display any channel or source on a local monitor or projector. The channel’s embedded audio is also sent through the video output port. You can even turn the video output into a large AV monitor by adding an audio VU meter to the displayed output. You can configure the video output port on Pearl Mini for many different output resolutions and aspect ratios. You can even configure the video signal to be displayed reversed on the output port using the mirrored feature. Yes! 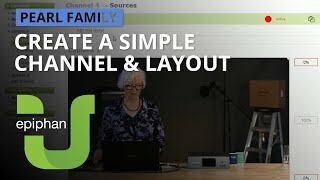 Pearl Mini has a visual layout designer that lets you build layouts exactly the way you want them. Combine video capture from your sources with images used for backgrounds, logos and overlays (transparent PNG is supported). Add text or time stamp overlays as well add metadata to the file to tag it with your company name. 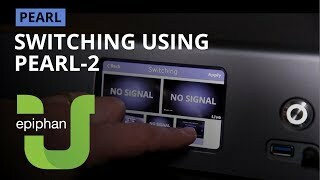 Can Pearl Mini switch, record, and stream over a Local Area Network (LAN) or is an Internet connection needed? Pearl Mini does not need a LAN or Internet connection to capture and record video. The user-friendly touch screen displays the video encoder’s stream for confidence monitoring and provides a fast and easy way to apply configuration sets, control switching or recording, and view system information. If connected to the Internet or a LAN via an Ethernet cable, Pearl Mini provides a web-based control interface for configuration and operation. 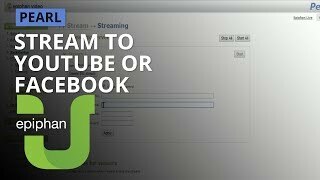 Live streaming over a private LAN is a great idea for employee training and it’s simple to do using Pearl Mini. 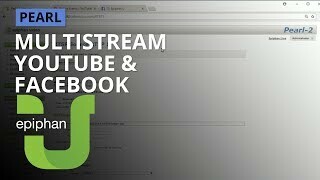 If you want to stream to a wider audience on platforms like YouTube or Facebook, you’ll need a network connection with Internet access; otherwise, your viewers or CDN won’t be able to access your live stream. Secure remote login gets you access to the web-versions of the Admin panel and Epiphan Live so if you want, you can remotely control recording and so much more from just about anywhere there’s Internet access. When Pearl Mini is connected to a video source or a display, it uses Extended Display Identification Data files to determine what resolution should be used. Each file below narrows the EDID to the specific resolution you are looking for, which can help with some sources. Pearl Mini already uses extensive EDID files, and most Pearl users will never need to use these files unless directed to do so by support.